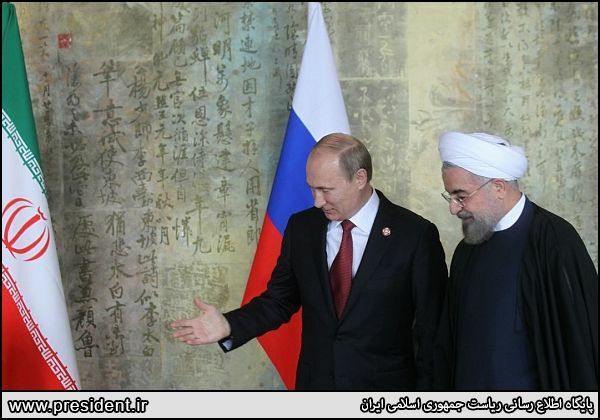 Iran’s President Hassan Rouhani and his Russian counterpart Vladimir Putin, in a meeting in China on Wednesday, conferred on the latest regional and international developments, and also vowed to do their best to pave the ground for the further enhancement of the bilateral tie. In the meeting held on the sidelines of the 4th Summit of the Conference on Interaction and Confidence-Building Measures in Asia (CICA) in China, the two sides voiced readiness to bolster consultations over regional and international issues, and called for reinvigorating mutual cooperation. Rouhani said the two countries’ relations are growing warmer and more intimate each day, adding that the two states’ reciprocal trust and mutual interests have increased in favor of establishing durable relations. “Russia is not just a neighboring nation with profound historical and age-old ties with Iran, but expansion of the two countries’ cooperation and partnerships will certainly pave the ground for creating a secure region,” he said. Rouhani said Iran-Russia cooperation on the establishment of peace in the region in the last few months has been “much effective”. “Development of relations between Iran and Russia will not just benefit the two countries and nations, but also serve the interests of all the regional nations,” the Iranian president stressed. Putin, for his part, voiced pleasure in the meeting with his Iranian counterpart, and described Iran and Russia as two neighbors and “reliable partners” with an age-old history of ties. “The two countries’ stances have been parallel even under the conditions of international crises,” the Russian president added. Putin said Iran and Russia are working on joint projects, “but there are still some other abundant possibilities and capacities existing on both sides which we should utilize for expanding the (bilateral) relations”. He said both Iran and Russia are entrusted with a grave responsibility for protecting stability, security and development of the Caspian region, which can be seen as a major and vital agenda of both states. President Rouhani, at the head of high-ranking delegation, arrived in Shanghai on Tuesday to participate in the fourth summit of CICA. The fourth CICA summit started work on May 20 and will end on May 21. China has been elected as the president of the CICA for the period from 2014 to 2016. The CICA is an international forum for strengthening cooperation to ensure peace, security and stability in Asia. The idea of the CICA was first announced by President of Kazakhstan Nursultan Nazarbayev at the 47th UN General Assembly session October 5, 1992. The CICA Summit is held once every four years and CICA foreign ministerial meeting in held once every two years. The CICA member-states include Afghanistan, Azerbaijan, Bahrain, Cambodia, China, Egypt, India, Iran, Iraq, Jordan, Kazakhstan, Kyrgyzstan, Mongolia, Pakistan, Palestine, South Korea, Russia, Tajikistan, Thailand, Turkey, the UAE, Uzbekistan and Vietnam. The non-member states include Armenia, Bhutan, Brunei, Cyprus, Georgia, Kuwait, Laos, Lebanon, Maldives, Myanmar, Nepal, Oman, North Korea, Saudi Arabia, Singapore, Syria, Taiwan, East Timor, Turkmenistan and Yemen. The observer member-states are Bangladesh, Indonesia, Japan, Malaysia, the Philippines, Qatar, Sri Lanka, Ukraine and the US. The Arab League and the Organization for Security and Cooperation in Europe (OSCE) are also international observer organizations. Iran and Russian in recent years have doubled their joint efforts to promote their relations in various political, economic, educational, cultural, social and military sectors.